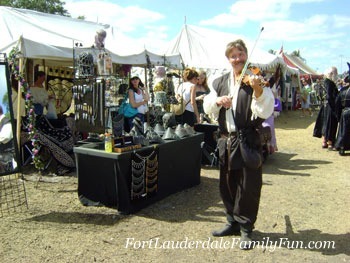 The Renaissance Festival is one of the more popular Fort Lauderdale events held at the Quiet Waters Park in Deerfield Beach generally in February and March for 5 consecutive weekends. During this time, the park is transformed into a Renaissance-themed destination. For those who love fantasy involving kings and queens, fairies and dragons, it almost feels like being transported back into childhood books and fairy tales. Among the professional performers who walk the grounds and interact with the public, event goers are also encouraged to dress up in their favorite Renaissance character. It’s also a chance for children and grownups alike to dress up in their Renaissance best. Children can get to wear once again last year’s fairy and princess costumes for the girls and princes and jesters for the boys, with the occasional pirate or wizard here and there. The adults can get quite imaginative and very convincing as knights, ladies, faeries and wenches. Some wear costumes that can make you go “whoa!” for their, um, creativity. There are several stages are set up throughout the park for performances by dancers, acrobats, entertainers and musicians. Several of these can draw a large crowd so make sure you have a schedule to know when the performances begin. Dance presentations and the Field of Dreams jousting and mock combat performances are very popular so make sure to arrive at the stages several minutes early to get a good seat and a good view! Plenty of activities are also available for children. The Kid’s Kingdom is a play area for smaller children with games and crafts (including a bounce house, which is not very Renaissance era, but it serves its purpose). There are also stages set up with story tellers and performances tailored for the younger crowd. Kids will also enjoy the human-powered rides (no electricity yet during that time) or the giant game of chess or dancing around the Maypole. Perhaps some of the most interesting people at of the Renaissance Festival are the artisans that demonstrate their skill and craft. The glass blowers always attract a patient and curious stream of visitors. The blacksmiths show what can be done fashioned with metal. But along with demonstrations, their creations are also for sale. Other vendors also sell everything from costumes to elves’ ears and pottery from booths and stands throughout the park. Some might see a few flaws at the Renaissance Festival. Not everything is strictly from the Renaissance period and we may find visitors actually dressed in costumes from different eras or places (pirates, for example, or Japanese samurais). True, it can be a bit commercial and a little too bawdy at times, but that’s all part of the fun! It’s also a chance to learn a part of history in a fun and entertaining way. The 20th anniversary of the Renaissance Festival promises to be a very special event this year. Make sure to visit at least one of the five themed weekends listed below. Choose the best theme for you and spend a day at one of the most unique Ft Lauderdale attractions! Proof of current vaccinations required. This last weekend will be the grand finale of the 20th anniversary of the Renaissance Festival that will surely include a spectacular show. For groups rates and season passes, please check rates at the Ren-Fest website. You can avoid the lines and buy tickets directly from the website. Tickets are also available at the festival gate. Note that there is a separate entrance fee to Quiet Waters Park (nominal, approximately $2 dollars per person at the park entrance). Go to the website to double check prices and gate opening and closing. This Renaissance Festival has grown in popularity over the years that this event’s planners have now created another festival in Miami. This year, the Miami Renaissance Festival will be held March 31-April 8, 2012 at the Cauley Square Historic Village. Don't miss it! 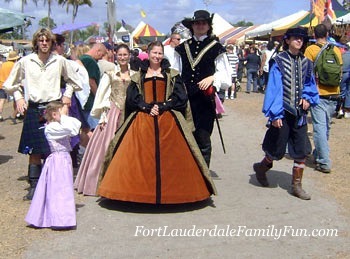 Go from the Renaissance Festival back to the Fort Lauderdale Events page.